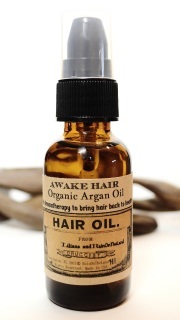 Awake Hair: 100 % pure Certified Organic Argan Oil with Essential Oils. Most Argan Oil formulations only contain a trace amount of pure Argan Oil, with silicones and added fragrances. Our Argan Oil has the necessary components to moisturize your hair back to health; it is naturally rich in unsaturated fatty acids like Oleic 6 and 9, vitamin E, and antioxidants. You can use 100% pure Argan Oil, on your hair and skin and have all the benefits, without any chemicals. Certified Organics: The Certified Organic Argan Oil used in this product is QAI Certified. The National Organic Program develops, implements, and administers national production, handling, and labeling standards for organic agricultural products. The QAI also accredits the certifying agents (foreign and domestic) who inspect organic production and handling operations to certify that they meet USDA standards. Rain on the Land uses the vintage apothecary amber style bottles. Amber is the most popular color used for storing essential oils and it helps to extend the shelf life of the product when stored properly.